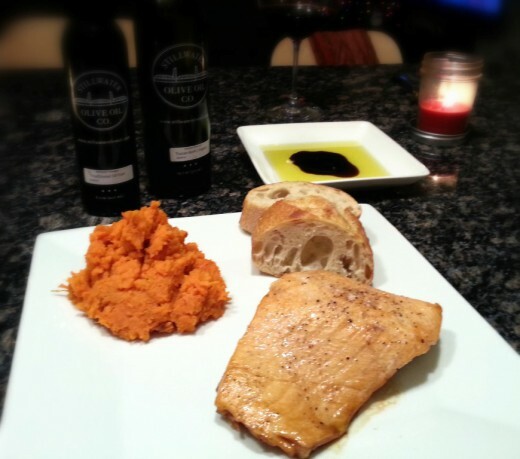 The first time I prepared salmon was about 3 years ago and it went terribly wrong. My idea of baking it on a cookie sheet was not such a good idea. The oil and glaze ended up splattering everywhere, leaving the oven a mess. That wasn’t even the worst part. It started to smoke so badly that I set our fire alarm off more than once. To be honest, I don’t even remember eating the salmon. 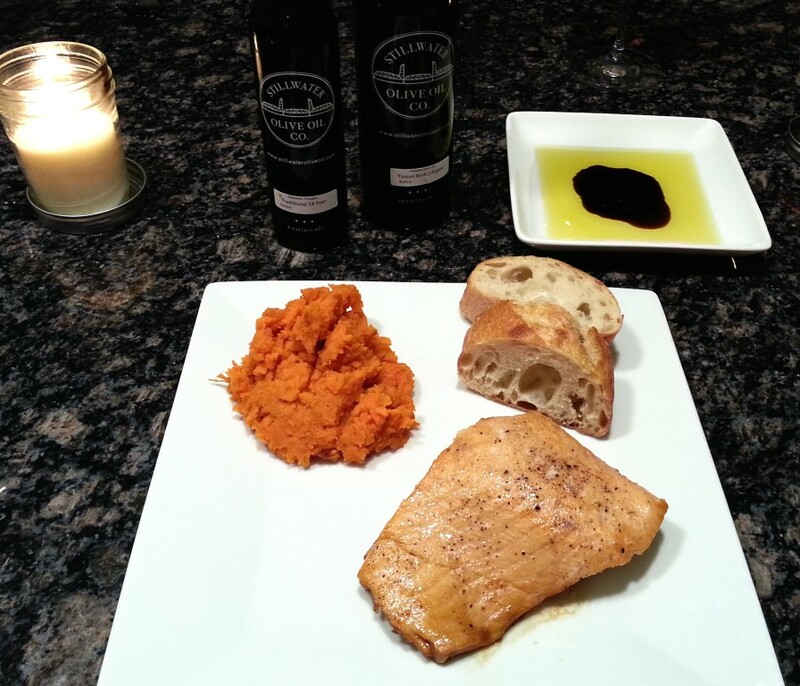 As you may have guessed, I’ve been reluctant to make salmon ever since that day. I’m not really sure what changed my mind, but while grocery shopping recently, I picked up some fresh fillets and decided that I’d give it another go. I contemplated baking it on a broiler pan, thinking it would help with the excessive smoking, but I eventually decided against that idea and chose to prepare it in my cast iron sauce pan on the stove. Start by seasoning the salmon fillets. Drizzle about 1/2 tablespoon of olive oil on each fillet, then season with salt and pepper. Next, mix up the glaze. In a small bowl, combine 1/4 cup maple syrup, 1 tablespoon brown sugar, 1 tablespoon soy sauce, and 1 teaspoon honey mustard. Drizzle in 1/8 cup olive oil while whisking. Season with salt and pepper. 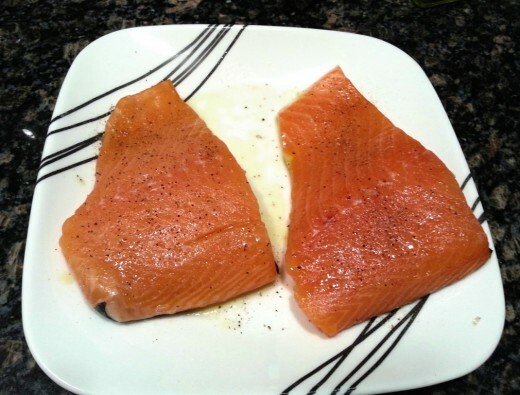 Heat 1 tablespoon of butter over medium to medium high heat in the pan, then place the salmon face down in the pan. 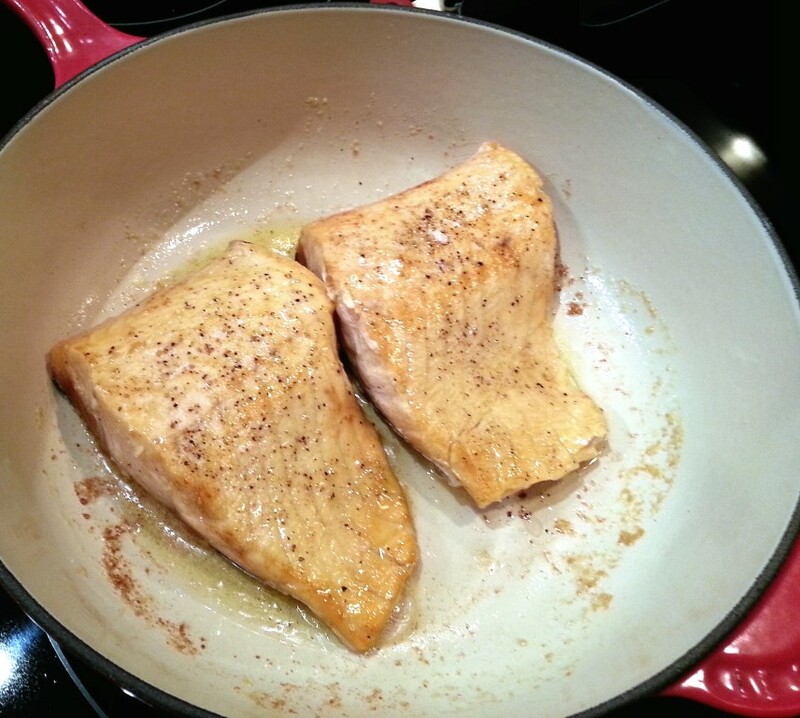 Sear for about 3 to 4 minutes, until the salmon is lightly browned. Using tongs, carefully flip each fillet over, so the skin is on the bottom. Pour the glaze on top of the salmon. 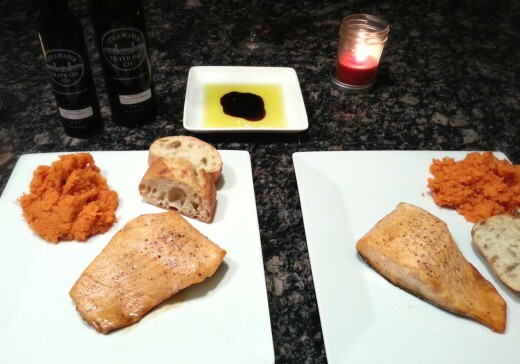 Cook an additional 3 to 4 minutes until the salmon is cooked through. You can also sear it for 1 to 2 minutes per side, cover the saucepan and place it in a 350°F oven to finish cooking if you prefer to go that route. I would just recommend using a higher heat if you’re searing for less time. 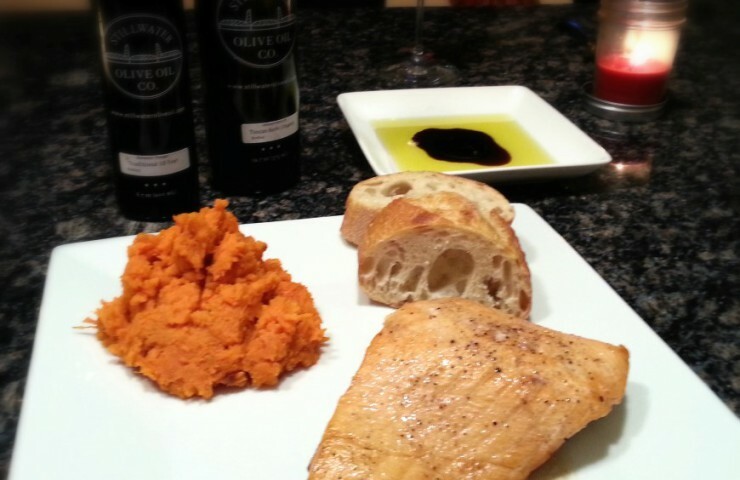 Transfer each fillet to a plate and serve alongside your favorite vegetable or salad and some bread. My husband and I recently bought Tuscan garlic olive oil and balsamic vinegar from the Stillwater Olive Oil Company so I’ve been serving it alongside bread for dipping. It always makes me feel like we’re in a fancy Italian restaurant. 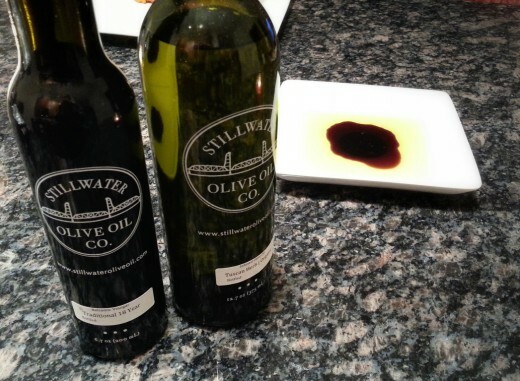 All you need to do is pour some olive oil onto a shallow plate and drizzle a little balsamic vinegar on top. Slice up a loaf of bread and toss it in the oven to warm it up before serving. 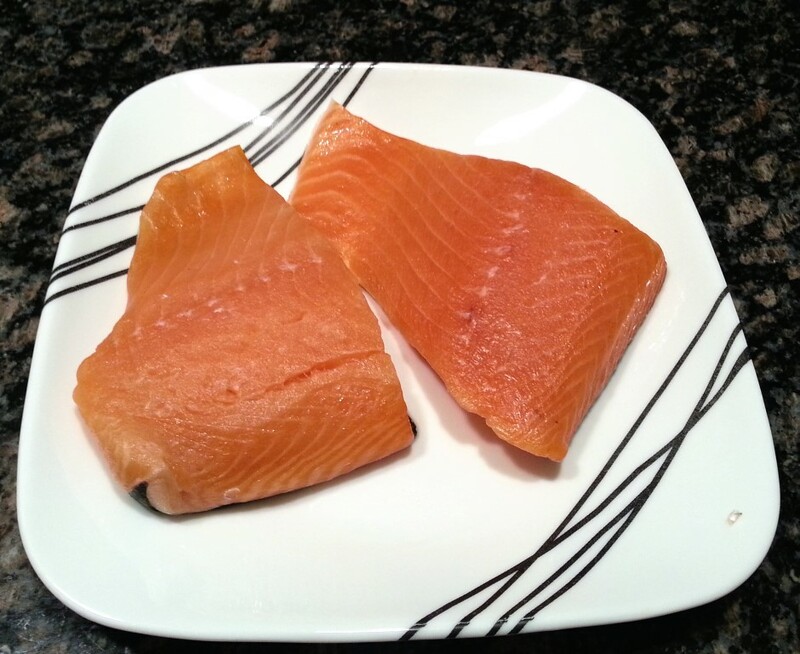 Drizzle 1/2 tablespoon on each salmon fillet, then season with salt and pepper. 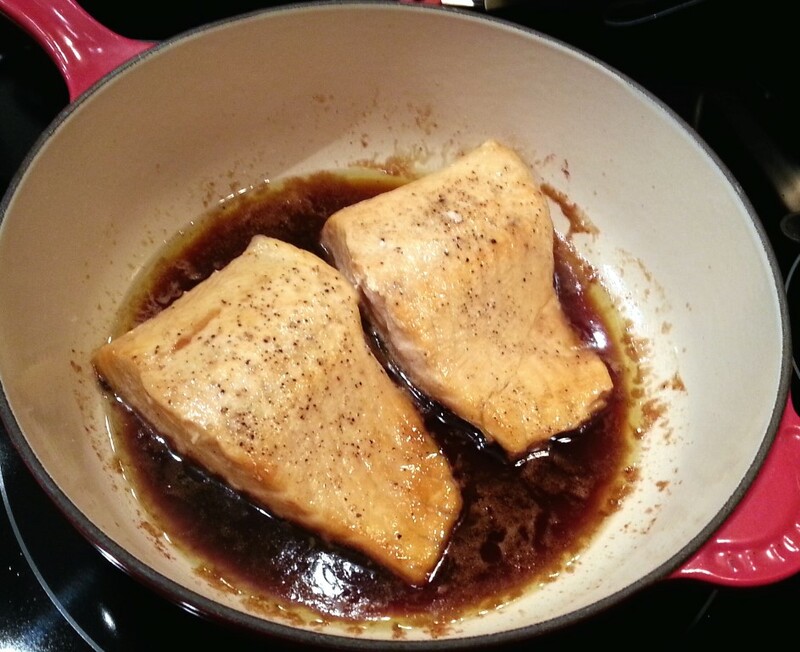 Mix up the glaze by combing the maple syrup, brown sugar, soy sauce, and honey mustard. Whisk and stream in olive oil. Season with salt and pepper. Heat 1 tablespoon butter over medium high heat in a cast iron sauce pan. 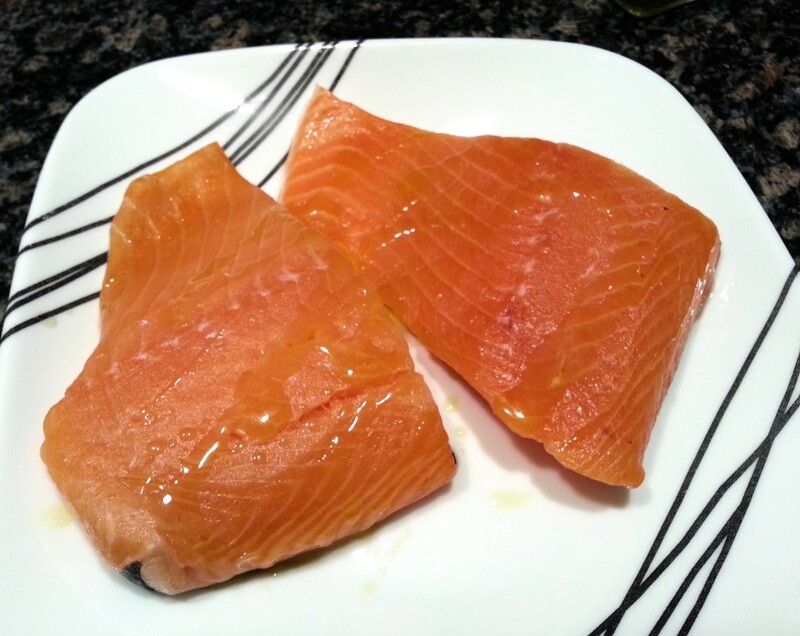 Place salmon in the pan, so the skin faces up. 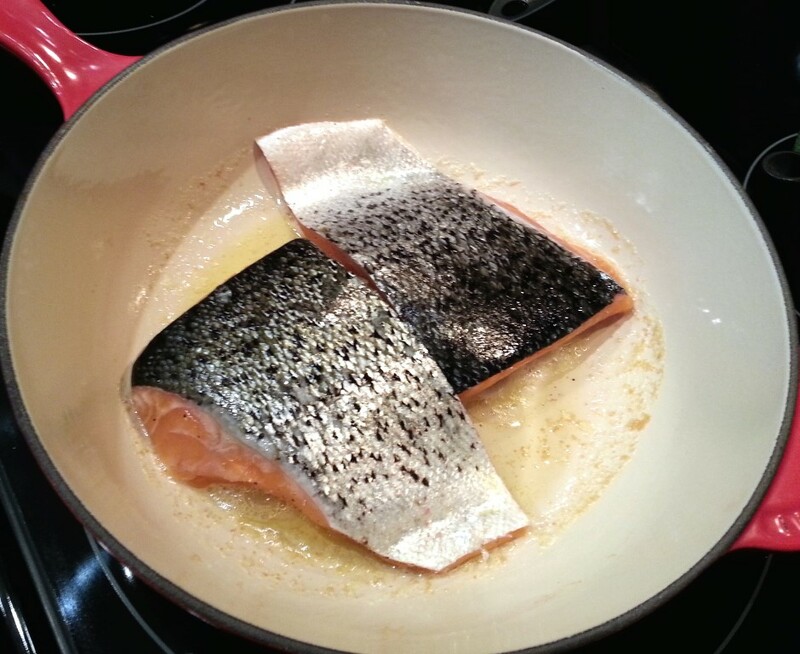 Sear for 3 to 4 minutes, until the salmon is lightly browned. Flip the fillets over, so the skin is down, and pour the glaze on top. Cook an additional 3 to 4 minutes until the salmon is cooked through.